I'm not sure what it's running , at the startup it says press something to reformat or space to continue , press space then another screen comes up . Andrew I could tell you where I get them but I'd have to kill you . The Hewlett-Packard HP 110 (aka HP Portable) was an MS-DOS compatible portable computer released in 1984. 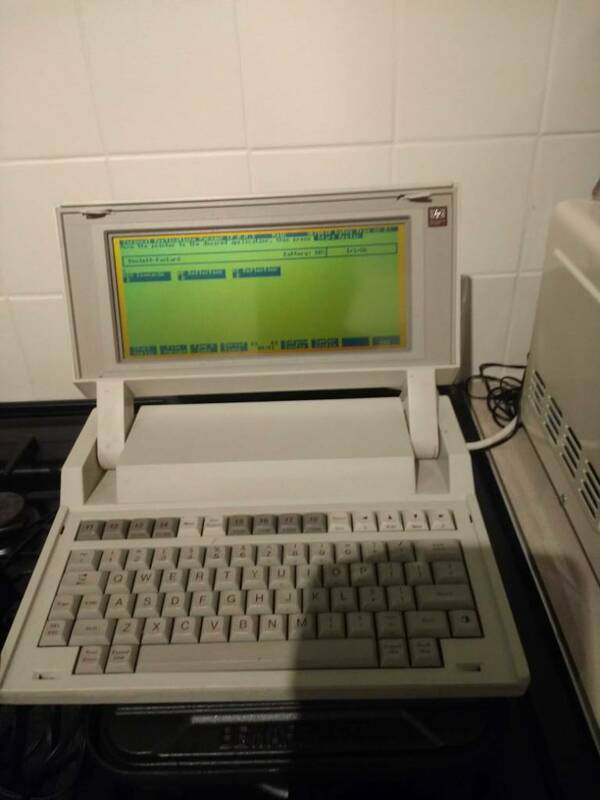 It used a Harris 80C86 running at 5.33 MHz with 272 KB of RAM. 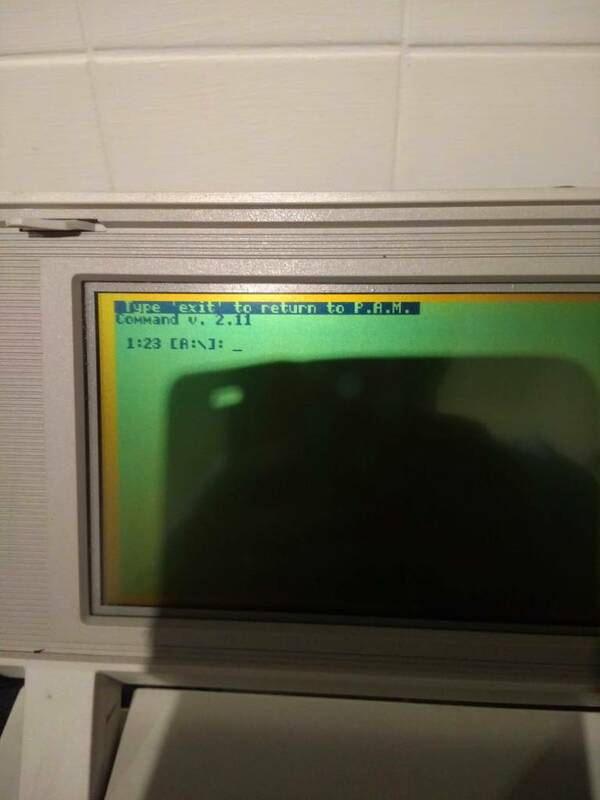 It had an 80 character by 16 line monochrome (480 x 128 pixel) liquid crystal display, ran MS-DOS 2.11 in ROM, and had the application programs MemoMaker, Terminal Emulator and Lotus 1-2-3 in ROM. The LCD could be tilted for visibility, and could be folded down over the keyboard for transport, unlike computers such as the TRS-80 Model 100 which had the display in the same fixed plane as the keyboard. 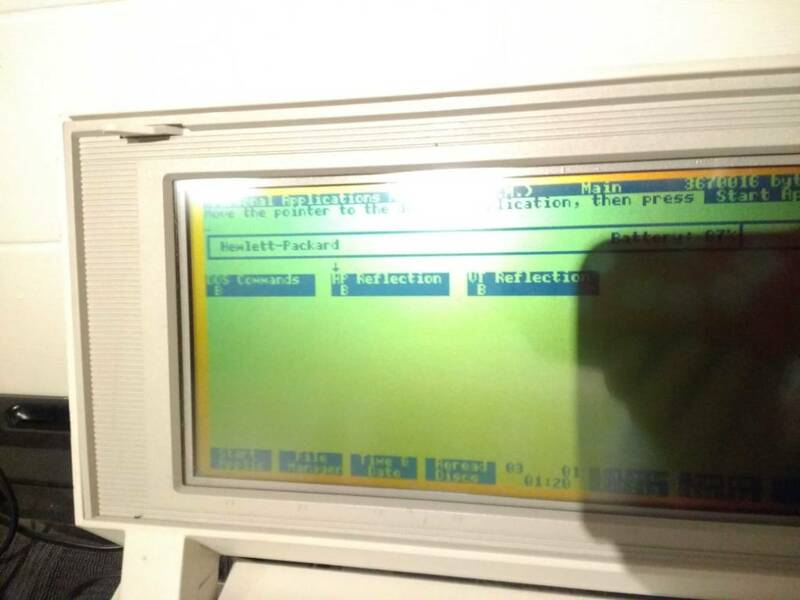 The HP 110 is similar to the Dulmont Magnum and the Sharp PC-5000, but all three computers were separately developed by their respective companies. At introduction it had a list price of 2995 US$ (today $7054.85). The HP 110 computer, also known as the HP Portable, is a portable MS-DOS computer produced by Hewlett-Packard. Probably the finest portable computer of its day, it has four-times the screen display as the popular but older TRS-80 model 100, and is screaming-fast at over 5 MHz. The HP-110 is fairly heavy at 9 pounds, but has exceptional battery life, up to 16 hours. The operating system is MS-DOS 2.11, permanently stored in ROM. The BASIC programming language is not built-in, you have to load if from an external drive. There is an enormous 256K of RAM, with MemoMaker, Lotus 123 and a terminal emulator built-in. Since the applications are executed directly from ROM, more RAM is available for user data. The RAM is divided between system RAM and electronic disk emulation - a RAM-disk. Application data is stored on this virtual disk drive, which is fully MS-DOS compatible - it can even be formatted. Since the CMOS-based RAM is very power-efficient, stored data will be kept for months on a single charge. On the down-side, there is no easy way to upgrade this system, as there are no internal expansion slots. It has no built-in floppy drive or hard disk, nor a standard cassette recorder interface. 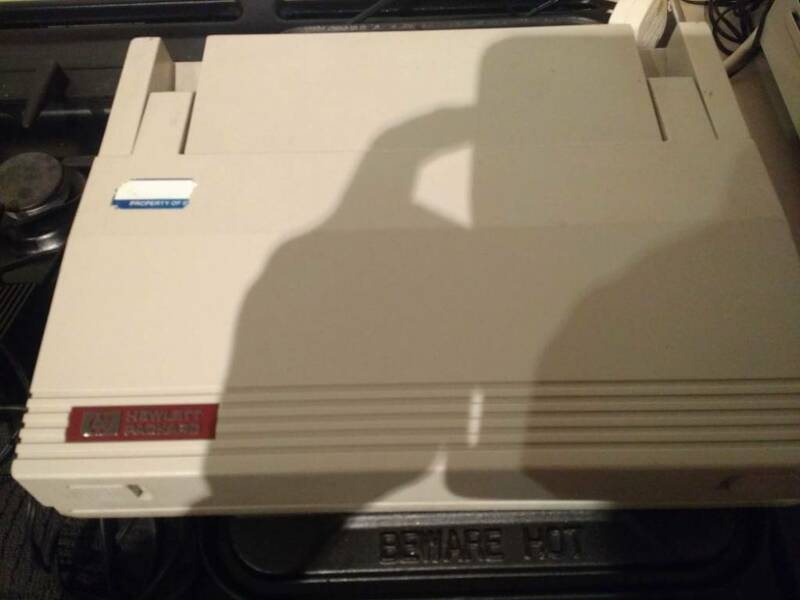 The external ports are an HP-IL interface, a serial port, and a phone connection for the internal 300 baud modem, which works with the built-in terminal emulator. Is it destined for your Computer museum? Ha ha Pete , Computer Museum , you would think so . You always come up with the information Pete , thanks for that , wow it was expensive . I don't think I would have bought one then . I've been to some of the meetings over 15 years ago and it was interesting stuff. Most of the meetings are London based, I think. It's good though, that old languages I've done a lot of work in are still available under Linux. Plus there is OpenVMS (OpenSource version of DEC's VMS OS, which I did some significant work in) is available for anyone who signs up. And this will run on modern processors.